getcalc.com's Prism Formulas & Calculator is an online basic geometry tool to calculate volume & surface area of the shape of rectangular & triangle prism, in both US customary & metric (SI) units. Prism is a three dimensional plane or geometric shape having both the ends very similar, parallel and equal line lengths. A square or rectangle base with the sides of squares called the rectangle prism, whereas a triangle face with rectangle base called the triangle prism. 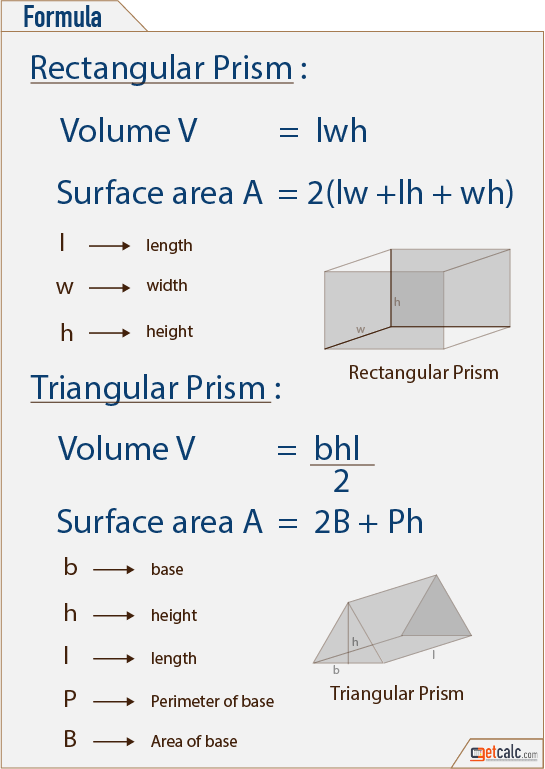 K-12 students may refer the below formulas of pyramid to know what are all the input parameters are being used to find the volume & surface area of rectangular or triangular prism. Below are the practice problems for grade school students, on finding what is the volume and surface area of rectangular or triangular prism. By click on the corresponding problem shows the step-by-step calculation or work with steps for how to find the volume and surface area of prism. For any other similar values, use this prism calculator to verify the results. The length, width & height of a rectangular prism measured as 25 inches, 15 inches and 12 inches respectively, find what is the volume and the surface area of that prism? The length of rectangular prism is 70 inches, width is 63 inches and height is 55 inches, find what is the volume and the surface area of that prism? The length, width & height of a triangular prism measured as 40 inches, 20 inches and 15 inches respectively, find what is the volume and the surface area of that prism? The length of triangular prism is 10 inches, width is 8 inches and height is 6 inches, find what is the volume and the surface area of that prism?